All curly girls love to shine. We are used to being the center of attention from our hair. When you think glam you think shine, but often our hair is not as shiny as we would like. Straight hair reflects light so you see the shine, whereas the bends of curly, coily, and wavy hair only refract light. This can give our tresses a more dull appearance. Is it fair? No ma’am but you can still get your shine on but in other ways. Rinsing with cold water after washing helps to close your hair’s cuticle, seal it, and give a natural sheen or slight shine. Many naturals already know the wonders of ACV on their strands for several benefits. The most popular reason is that it removes product buildup, but how many are aware that it also leaves the hair cuticle soft and smooth? With that smoothness comes a natural shine from the closed cuticle that allows the hair to reflect some light. Air-drying your hair instead of using a hooded dryer or diffuser allows the hair to dry naturally. If none of those sounds like the route you feel like taking to add some much needed shine and glam, then take a look at another way to get it without too much work on your part. Hair serums are often silicone-based products that coat the surface of the hair without penetrating the hair’s cuticle like some natural oils. They add shine and softness to the hair. Many protect the hair from the sun and they remain on the hair until you wash them out. It is best to add them on clean hair to keep them from creating buildup. The serum even reflects light and makes your tresses look shinier and healthier while protecting them from dust and even humidity. Buy a brand that works, not just the one that is the cheapest. You truly get what you pay for. Apply to your strands (not your scalp) and work through with your fingers or a wide tooth comb. Using too much can create buildup or weigh your curls, waves, or coils down. Use sparingly and add more only if you see you need it. Not all hair serums have silicone and not all curly girls are happy to use them, regardless of the silky benefits they bring. 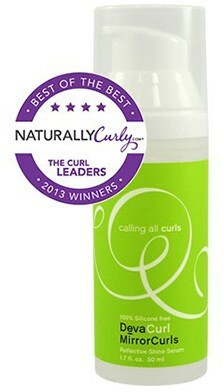 Here are a few brands that most curly girls find are the best and get the job done all without the burden of silicones. You will not lose moisture with this serum that has water, flax seeds, aloe barbadensis leaf juice, sea vegetable complex, coconut oil and castor seed oil that delivers shine and softness. 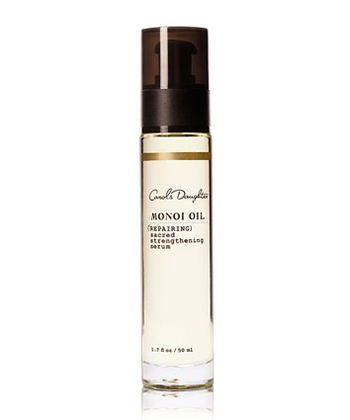 This serum is designed to nourish, add shine, and define all with a light and non-greasy feel. Smooth out your edges and reduce your frizz with a light fruit scent. Olive fruit oil and grape seed oil make up the first five ingredients in a serum that boasts of reversing and preventing damage to even the most distressed tresses. Heat styling, color treating, and chemical straightening take a damaging toll on your strands, so this serum rebuilds that damaged hair from the inside out. PEG-10 sunflower glycerides, water, silica, sunflower seed extract, balm mint extract, and hops extract help to deliver shine and softness to a serum that made the Best of the Best in 2013. All textures will benefit from this 99% botanically infused, silicone-free moisture adding serum. 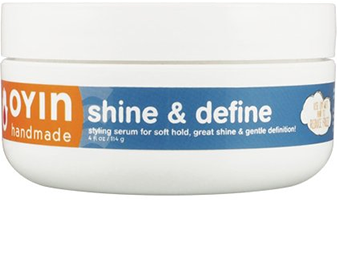 Get superior shine with this satin smooth serum. Cut your styling time with this alcohol-free and silicone-free styler that will add shine, movement, and softness to your tresses. A penetrating blend of shea butter, argan oil, carrot oil, and macadamia nut oil that fights frizz and adds shine to dry, damaged tresses. Lightweight and not greasy, this elixir uses mineral-rich sea kelp to nourish and smooth your hair’s cuticle all without the help of silicones. Water, glycerin, propylene glycol (humectant), and guar hydroxypropyltrimonium chloride (adds conditioning properties) create this superior thermal protectant for heat styling. The humidity resistant formula cuts your drying time in half and you finish with gain a sleeker, straighter look longer. A moisturizing conditioning serum that prevents frizz with the water, coconut oil, aloe vera leaf juice, sorbitol, and PEG-50 shea butter. 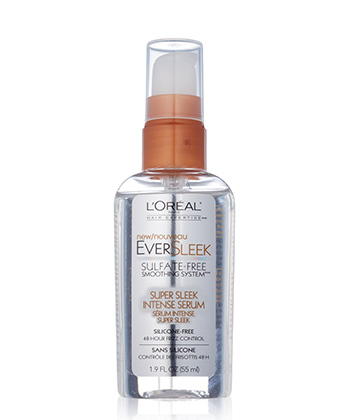 Leave frizz behind while you gain softer, sleeker, and shinier tresses. This hair growth serum is potent due to its ingredients. This all-natural powerhouse with 100% organic coconut oil, sweet almond oil, grape seed oil, select Ayurvedic herbs, and sulfur powder helps to grow hair and moisturizes your tired tresses. Soybean oil, virgin coconut oil, champagne extract, and caviar extract make up a luxury-enriched elixir that boasts of enhancing hair growth and hair strengthening. Bring dull, dry hair back to life with the power and richness of caviar and champagne. Water, glycerin, and PEG-40 hydrogenated castor oil will make your strands say goodbye to frizz. A smoothing serum without the weight of silicones, this intense product helps control even the most rebellious and unruly hair.